Anna, aka Jammin Anna, is a 7-year-old black female born August 18, 2007. Her sire is Switzler Jammin and her dam is Red Fire Anna. 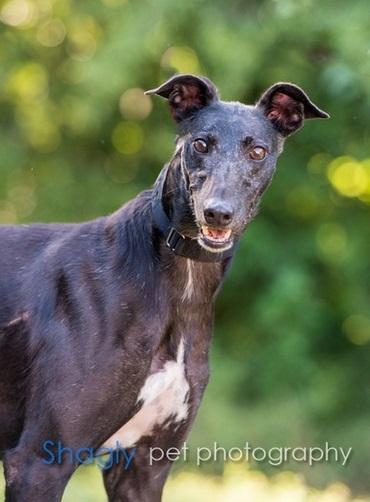 Anna has 55 races on record at Greyhound-data.com, all in Palm Beach, from July 2009 to October 2010. 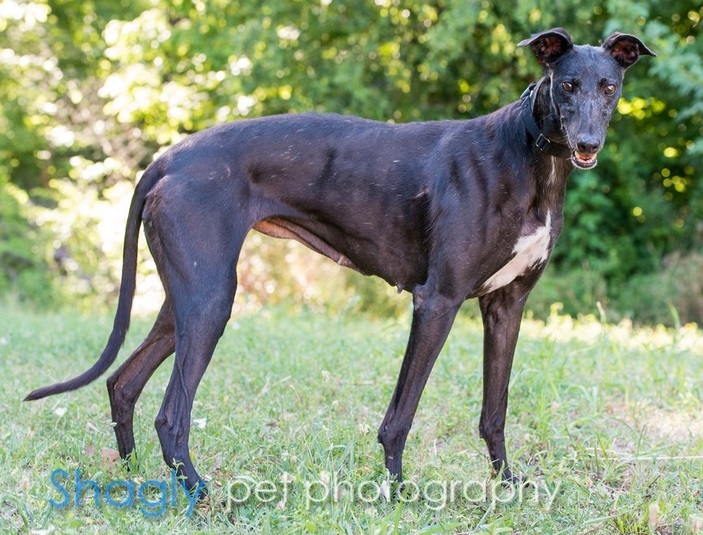 She then retired to a breeding farm, and proceeded to whelp 2 litters of puppies with sires Atascocita Leroy and Djays Octane. X-rays were taken when Anna was spayed which showed her right central tarsal bone is medially displaced and is irregular in shape. This is consistent with a previous fracture to the area. She does not seem to be in pain from the injury nor does she exhibit any lameness. Eight teeth were extracted when Anna had her dental, and the veterinarian believes she is prone to CUPS (Chronic Ulcerated Periodontal Syndrome). Anna should not live with cats. Anna is a very fun foster girl. She loves mornings and can't wait to have breakfast and start her day with a few squeaky toys! She is a great eater and loves a good romp around the yard. She doesn't get on the furniture or have accidents in the house, but she is very food motivated so you must not leave any good smelling groceries too near the edge of the counter, or she feels they might have been left there for her. She gets along well with my other three greyhound girls, but likes to think the toys are just meant for her. Her and my eight year old female greyhound love to chase each other in the back yard, and I can say she acts much younger than her stated age. She is very loving and will follow you around so you won't get lonely. Anna really loves children, and she is very gentle with them. 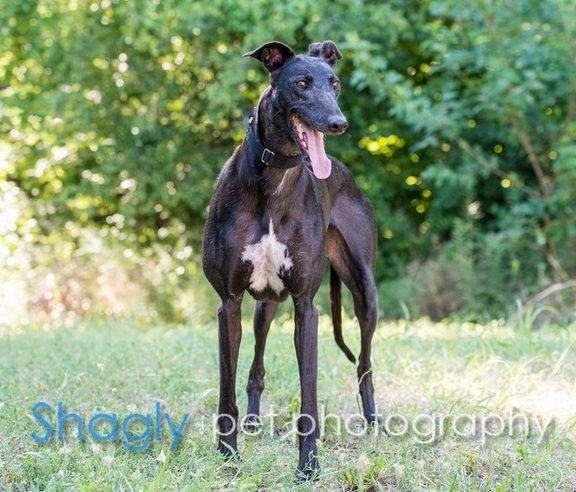 She would do well in a home with another dog that is not bossy. Anna is just a sweet girl!